They have criticised the quality of analysis which preceded the councils decision yesterday to form a development company which may be used to build on the Lowfields playing fields. The Council also decided to back financially the provision of football pitches at Bishopthorpe although these are too far away to be relevant to the leisure needs that already exist and those of the 350 new residents that the Lowfields development will attract. Many of the pkanned hiomes will be for private rent. They will not be added to the Councils housing revenue account and so will not be subject to “right to buy”. However private rent levels are high. Typically a 3 bedroomed house in the Lowfields area would cost around £800 a month in rent payments. 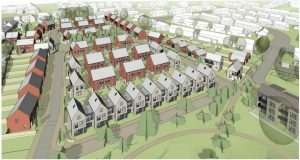 The Action Group rightly point out that the decision is not only risky for taxpayers but also premature because the planning application for the site has not yet been considered. The Lowfields scheme has been criticised by local residents for providing an inadequate amount of open space and for the cramped and unimaginative layout design. NB. Both Liberal Democrat and Labour candidates in the 20-15 Council elections promised to conserve the Lowfields playing fields and restricted development to the built footprint of the old school.